Stan and Ollie was featured in the recent British Film Festival and was very well received, so I was looking forward to seeing it. I was not disappointed. By 1937, Stan Laurel (Steve Coogan) and Oliver Hardy (John C. Reilly) were the biggest comedy stars in Hollywood, but cracks were beginning to appear with contractual obligations at Fox Studios. Fast forward to Newcastle in England in 1953, where they are to begin a live (now legendary) tour and a new movie. The movie is a version of Robin Hood or "Robin Good" which Stan is rewriting. He has come up with the idea to rob from the poor and give to the poor, effectively cutting out the middle man, and the rich will be none the wiser. Brilliant. The film asks the question: "Can you have Hardy without Laurel?" And vice versa. Are they two peas in a pod or are they are like an old married couple on the verge of divorce? Their relationship is complicated, and so is that between their bickering wives: two double acts for the price of one. Their unique friendship is damaged but there is still rapport despite a perceived betrayal. Although the film is a comedy, it is also touching at times with real pathos. One poignant moment is when Stan says to his partner, "I loved us, but you never loved me". Sadly, even after Ollie died, Stan continued writing scripts for Laurel and Hardy. 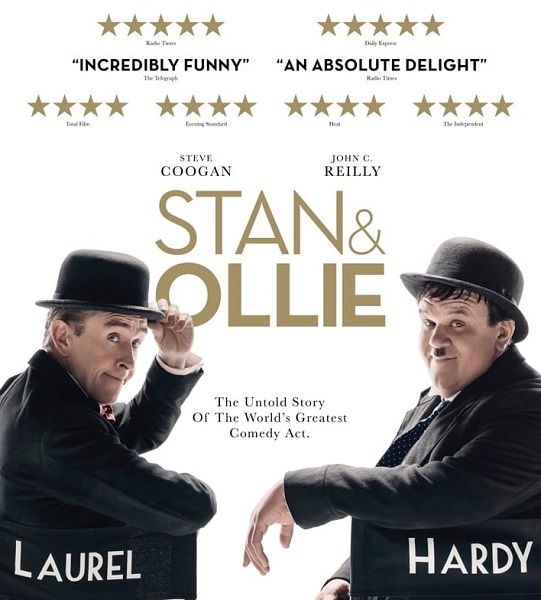 Stan and Ollie is based on the book Laurel and Hardy: The British Tours by AJ Marriot and has been written with sympathy for the characters by acclaimed screenwriter Jeff Pope. I have never been a great Steve Coogan fan, but this could be his best role ever. He has nailed the character of Stan with much respect for him. His facial expressions, nasal whine, and his likeness are uncanny. Stan (and Steve) perfected the glaikit expression (which is a Scots word meaning stupid or vacant). A nod to Stan's Glasgow childhood and his affection for Scotland appear throughout the film, e.g. a performance in Glasgow, a scene with the duo in kilts, a token Scottish actor, a reference to Scottish cuisine and a dig at haggis (figuratively not literally). Some of their movies even featured Scotland. Stan said that he didn't miss England one little bit, but the duo was loved and welcomed by the the Scots and the Irish. There are plenty of name checks, to set the scene of Hollywood and movies at the time, such as Myrna Lloyd, Clark Gable, Carol Lombard and Charlie Chaplin. In fact, Stan had worked with Chaplin and was bitter that the pair of "parvenus" weren't treated as well as Charlie. It was the era of vaudeville and slapstick. One-liners come thick and fast in the film, just like their movies: Stan's got a million of them. For example, Stan said that he was never getting married again – he would just find a woman he didn't like and buy her a house! Along with the gags, singing and dancing, and even yodelling, are the stuff and nonsense that make this film so good. Laurel and Hardy sang the funniest ever version of the old song "Trail of the Lonesome Pine" (In the Blue ridge Mountains of Virginia…). It featured in their film Way Out West and is a comedy classic. The dance sequence in the comedy Western (whoever heard of such a thing?) is a classic. If you are already a fan of this clever partnership, you will be delighted that their old familiar catchphrases are included such as, " Another fine mess you've gotten me into". The visual gags are superb and make other comedy duos like Abbot and Costello look crude by comparison. The double door routine at the railway waiting room – in and out - is pure dead magic. The trunk scene at the railway is really funny too as is the Live on Tour in London scene with the ubiquitous black hacks and the taxi doors routine. The bell-ringing scene in the hotel had everyone in the audience giggling. The hospital set with eggs and nuts is madness. Beautiful madness. The list goes on, but I won't spoil your fun. The film was nominated for three BAFTA Awards: Outstanding British Film of the Year, Best Leading Actor (Steve Coogan) and Best Make Up/Hair. The work of the hair and makeup designer, Jeremy Woods, is remarkable. It was also a Golden Globe Nominee for Best Performance by an Actor in a Motion Picture - Musical or Comedy (John C. Reilly). The sets and costumes contribute to the period feel and it is a feast for the eyes. The kings of comedy may be older, but they're not done yet – rigor mortis hasn't set in. They aren't spring chickens any more, but they intend to go out with a bang. Where do they go from here when trouble follows them around? What you will say after you leave this this film is that it was fun while it lasted. "I'll miss us when we're gone, " said Stan and so will you. Unbelievable. It certainly is. Make sure you stay for the credits as there is extra material and old black and white photos of the real Laurel and Hardy. Well that went well. It certainly did. Please remove all bowler hats. -	If you insist on making a mess, make it a fine mess. -	Banana Peel is to be binned and not placed strategically on the floor. -	Best seating is way out west. -	Fire exits are real, not painted on the wall. -	Hard boiled eggs and nuts are to be crunched quietly. Why? Unbelievable. It certainly is!